Get everybody together around the table this summer with this stunning 11 piece Agio Franklin fire pit dining set from RC Willey. This set comes with 8 woven bar height chairs, large table, and fire pit. Keep the conversation and good times going late into the night with this fire pit that features a real gas flame and offers warmth and ambiance. Includes fire pit, two u-shaped tables and eight bar stools. 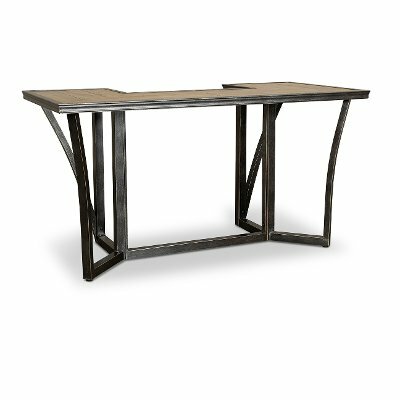 With a unique U-Shaped design, this outdoor patio bar table from RC Willey gives you the flexibility to gather and serve food and drink in the way you want. This Franklin collection table features hand finished aluminum frames and a modern design. Ideally paired with the bar height Franklin Fire Pit Tower, two of these bar tables help create a unique place to enjoy dinner outside. Get it today and make your outdoor space, deck, patio or pool area as fun and inviting as your indoor space. This patio bar stool from RC Willey is part of the Franklin Collection and features a timeless All-Weather Hand Woven PE Wicker over an Alumicast frame. With a reticulated foam cushion under the seat, this chair is both stylish and comfortable. Pull up to the bar and enjoy good food, drinks and company this summer!